This week (while still patting myself on the back for my first sub 2-hour half marathon!) I found myself trying to explain to my husband why I needed to keep doing this. Why I needed to keep running and keep going to yoga. Why these hobbies where more than just hobbies. I think the conversation started when we talking about our AmEx bill. 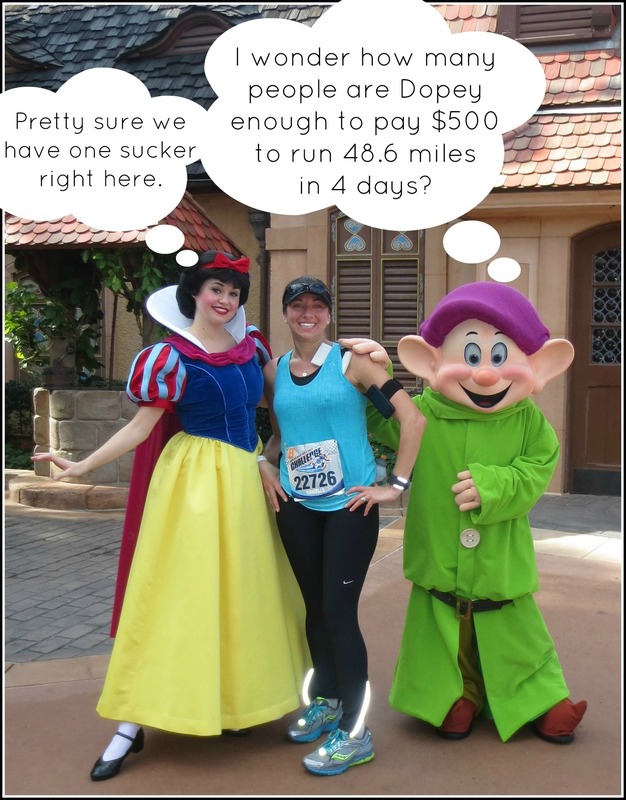 My membership to my yoga studio was up for renewal and I was about to fork over several hundred dollars for the next six months, I just registered for the Wine & Dine Half Marathon and despite it’s hefty price tag I’m pretty much ready and waiting for registration to open for the Inaugural Dopey Challenge. In hindsight I think I may have actually been trying to rationalize all these costs to myself more than to him, because despite the fact this his wife decided to pick up a few expensive hobbies right around the same time she decided to leave her job and go back to school for 5 years (all while we’re trying to save to buy a house) the man (who I’ll be nominating for sainthood) has never said a negative word about any of it. And while I struggled to put into words what running and yoga has done for me, he didn’t need me to tell him because he could see it. I am less stressed, happier, more confident and I continue to amaze myself with what I can accomplish. From running my first half marathon, to my first full…then Goofy, becoming a certified yoga teacher and now a sub-2 hour half marathon all in less than 2 years. Focusing on running and yoga has at the same time helped me focus on other things. But, I am pretty sure to keep those other things in focus I need to keep running and keep yoga-ing. Running and yoga are like the cross training for the rest of my life. And the rest of my life is a pretty important thing, which makes the price tag that comes with these “hobbies” a little easier to swallow. I really like the way you explained how running and yoga keep you balanced. I have not been keeping to a consistent running schedule AND feel stressed right now. It’s probably connected! I’m so glad you understood what I was trying to say because I was having such a hard time putting it into words! There is definitely a connection between working out and how I feel and now that I know it’s there I don’t want to stop! You have inspired me to try yoga Danielle. I have downloaded an app for my phone and I am starting tomorrow. I cannot wait! Yeah! Yoga can be frustrating at first for a lot athletes because it’s so much slower than were used to going in out other sports, but that’s why it’s so great! It’s the yin to the yang of running, biking, etc! A great way to slow the mind and take the time to really focus on your body. Good luck and please please please let me know if you have any questions, I’m more than happy to help! Its crazy how expensive running can be but I always tell myself about the doctor bills I am saving by being a healthy weight and keeping a healthy mind that running and yoga give me!! (Although my boyfriend still doesn’t get why I pay money to run, luckily I have been crazy for this stuff since he has known me)! Maybe we are crazy, but its a great kind of crazy! Yes! That’s actually a benefit I hadn’t even thought of when I was writing this, but it’s so true, keeping out bodies healthy now will definitely be beneficial in the long run! Couldn’t do any of this without you, love you! MWA! I can completely relate to this post, and you articulate everything so well. I was just talking with a friend last night about how I view my career as a tool to give me the ability to do things outside of work that make me happy. Life is about choices – even if the ones we make mean we have to wait longer to buy things that we want, as long as we’re working to better ourselves and be happier, I think personally that’s the right call nearly every time. So happy for you! Exactly! And I think that’s one of the reasons that I was so unhappy at my old job…it didn’t leave room for ANYTHING outside of it, it WAS my life. I am so much happier now that I have the time to do things for me and that I recognize how important it is! Your confidence is shining through in the post. The new fitness gains you have made have enabled all aspects of your life to improve. Way to go on life Danielle. It is really fun following your blog! Thank you so much Pam! It really is amazing to have an online support system too, I love hearing about all my blogging/ running friends successes as well! your such an inspiration and have accomplished so much in such a short time!! its amazing how a physical workout (running, yoga, etc.) can completely change us on the inside – i know this past year and a half i have grown more than probably my other 23 years combined. Good for you Jackie, keep it up! I wish I had discovered this at 23, but better late than never, right?? Here’s to amazingly supportive partners! I don’t know where I’d be without mine. Sounds like we both scored in that department! Yes, definitely, we’re both very lucky! Couldn’t have said it any better..just replace yoga with CrossFit 🙂 Def keeps me grounded and clears my mind. And without either, I wouldn’t have found the Herd or many of my other good friends. Totally worth it! Yeah for the herd! I mean who would I talk running and Disney with if I didn’t have you guys?!? Pretty sure my other friends are sick of hearing about it! I know your struggle. My husband and I finally had to cap our spending on runs. Since we’ve done that it has helped us because while we are getting the physical benefits of running, it was putting an added financial stress on us because of how much money we were spending on races. I think we’ve finally found a happy balance. Exactly, I really need to budget myself better when it comes to these races, moving forward I’m going to try to do a better job of that. The crazy thing is when you start running it’s like, “oh, running is so inexpensive, all you need is sneakers!” NOT TRUE. Agreed. I’ve been doing the debate on doing the Dopey because of money. But I really want to because I think it will be something really special. As always good reading. Now for my son Jason he IS a very lucky husband, the way I see it he’s also found a very great friend in you. Totally love that quote at the end! You are so right! What a great way of putting it! While I’m not a big racer, running, yoga and occasional interval workouts are what keep me sane and happy. It has gotten me through a really tough few months and its so engrained in me, I can’t imagine ever going back to the way I was before focusing on my health & happiness. So glad to hear that running and yoga helped you through a tough time…it’s amazing what taking some time to focus on ourselves can do for us! Keep it up! It’s so great that you have Jason to support you. 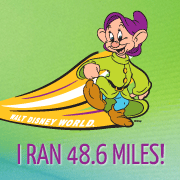 I am constantly grateful for the support Doug gives (I mean, hello, running the Dumbo on our honeymoon!). When I started running, he was always supportive of all my crazy registrations and then when I started seeing a trainer, although it’s a huge expense that we really can’t afford, he is supportive still because he sees the change in me, how my running and working out make me feel better about myself. Long story short (too late, I know) I completely empathize with this post. That first half marathon changed my life. And I fully intend on running, working out (and yoga too lol) a part of my lifestyle. Haha, Doug may win the award with letting you detour from your honeymoon for Dumbo! So glad that you can relate to my post…I wasn’t sure if it sounded crazy when I wrote it!